We live in a speeded up world, where we have to meet the requirements of the family, the workplace, our environment day by day. This modern lifestyle makes greater demands on our body than we would think. Stress, tiredness, psychical and physical debility, desultory nutrition and lack of exercise are unfortunately elemental parts of our life. Caused by the growing every-day stress at our jobs, environmental pollution and lack of time for relaxation and regeneration more and more people are suffering on the diseases of the modern times. Sometimes everything seems so hopeless… Take your time and have a little break! Do not worry; we have the solutions how to cure these problems. Luckily, our country is specialised in Health and Wellness Tourism because of its special situation. Visitors can expect health resorts which offers unique natural and healing conditions, professional medical staff, high standard of medical services, the most modern equipment and of course very attractive prices. Pamper your body and soul! The therapeutic effect of thermal waters enables a wide range of uses both in terms of prevention and treatment. The materials in the water are absorbed into the body through the skin, at the same time the body excretes certain materials and also during bathing the solutes in the steam over the water are inhaled. Thermal medicinal waters’ typical indications are for locomotor, gynaecological, dermatological problems. The medicinal waters can be used not only for bathing but in case of disorders of the stomach, the intestines or the kidneys and also in case of certain metabolic disorders they can be used within the confines of a drinking course. Inhaling the steam of medicinal water is recommended against respiratory complaints. Important for the development of teeth and bones. Lack of calcium can cause osteoporosis and significant tetanus (spasmodic condition). An important element in replacing protein and carbohydrates and is needed for the working of the muscles which includes the heart. Magnesium also plays an important role in growing and developing bones. When there is not enough magnesium present in the body it can cause irritability, insomnia, difficulties with concentration, muscle spasms, dizziness, and headaches. Found in combination with sodium and potassium. Along with hydrogen in the stomach, produces stomach acid. The main task of iron is to deliver oxygen, carbon dioxide and electrons. Animal proteins and vitamin C increase the absorption of iron in the body, while tannic acid and the phytic acid found in grains decrease the absorption. Lack of iron can cause anaemia, weakness, paleness and fatigue. Important in the development of teeth and bones. When there are not enough fluoride intakes in the body, this can cause cavities to develop easier in the teeth. For expectant mothers and mothers with newborns, it is especially important to provide babies with the needed fluoride. Too much fluoride, however, is unhealthy. Wellness is definitely not just about bathing. It is the body’s and the soul’s clear refreshing. Thermal baths are more than curing water and not just against diseases. To describe the word "wellness" is a bit difficult; probably we would say the "life of the healthy people". Everyone needs to attend body and soul - wellness is the best way to get it. Wellness facilities serve not only the healing but also the prevention, relaxation and recreation. Regarding the ever-increasing demands of guests, wide range of facilities is offered for lovers of wellness and healthy living as well. Bath - swimming-pool, effervescent bath, thermal healing pool, thermal tub-bath, weight bath, carbonic acid bath, pool for kids. Sauna - Turkish bath, treat bath, Finnish sauna, frigidarium, bio sauna, infra sauna, hamam, tepidarium, caldarium, laconium, serai. Massage - acupressure massage, cellulite massage, therapeutic massage, foot reflex massage, La-Stone massage, Lymph massage – drainage, sport massage, Swedish massage, Thai massage. Beauty and style - natural sea and vitamin pack for face and body, algae pack, mud pack, body-wrapping, Cleopatra bath, peeling, vapozon, ultra- and infracure. Therapy and relaxation – balneotherapy, hydrotherapy, acupuncture, acupressure, ayurveda, oxigentherapy, aromatherapy, bio resonance therapy, electrotherapy, Kneipp cure, Mayr cure, light- and voice therapy, phytotherapy, Thalasso, vital massage, underwater massage, Yumeiho massage, living and dining guidance. Gastronomy - reform and vegetarian supply, cure tea, juicy drinks. Sport and activity - cardio and muscle nutritive machines, leisure and communal programs. The hotels in Hungary represent the highest quality and provide a large choice of services, various baths and saunas, relaxing massages, beauty treatments and healthy food according to the standard system of wellness hotels. There are lots of spa hotels, thermal hotels and wellness hotels in Hungary. 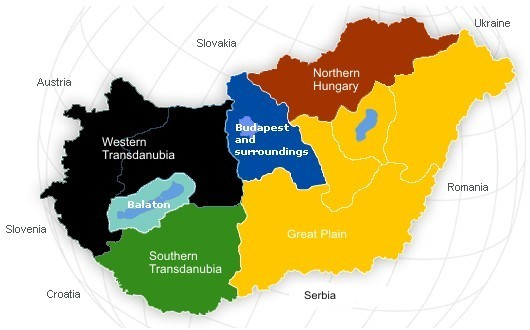 Most of them are located in Budapest, Gyula, Hajdúszoboszló, Hévíz, Sárvár and Zalakaros. They are world-famous for the exceptional quality of their healing waters. The Hungarian spa hotels, thermal hotels and wellness-hotels are awaiting their guest, craving for active relaxation, with a wide range of program alternatives. Budapest's surroundings offer lots of attractions. Right to the north of Budapest you'll find some exciting holiday spots starting with the Danube Bend providing a breathtaking view. It is here that the Danube makes the biggest turn all along the river. Many significant chapters in medieval Hungarian history were played out over the estates of the Royal House of Árpád, while many rich historical, cultural and architectural treasures have been preserved for posterity in the region. Major Cities & Attractions: Szentendre, Visegrád, Esztergom, Vác, Gödöllõ, Ráckeve, Zsámbék. More information can be found about the hotel at our accommodation point/wellness hotels! Hungary’s highest mountain rage cuts diagonally through the north of the country from the Danube to the Tisza River. The 700-900 meters ranges of the Cserhát, Mátra, Bükk and Zemplén Mountains hide unique natural and cultural-historical treasures. Northern Hungary boasts with the highest peak of Hungary, the 1014 m high Kékestetõ mountain top. Hollókõ village and the Caves of Aggtelek are under the protection of the by the UNESCO's world heritage program. Folk art is similarly unique to this region, Palóc embroideries and Matyó folk costumes bear no resemblance to anything elsewhere in the country. An abundance of castles, historical towns, medicinal spas and quiet resorts await the visitors. Major Cities & Attractions: Hollókõ, Mezõkövesd, Eger, Egerszalók, Szilvásvárad, Miskolc, Lillafüred, Szerencs, Tokaj, Sárospatak, Aggtelek. The sand-hills of Bugac in the middle of the Great Plain stretching from the Danube to the eastern border of the country together with the alkaline soils of Hortobágy to the northeast give the flat region of the incomparable Hungarian Puszta. In the region the typical farm life has survived, as have the ancient domesticated animals and bird species, which in Europe are unique. During the spectacular horse shows the tourists has the opportunity to learn about the traditions of the earlier pastoral way of life, animal husbandry of the Puszta and taste fine Hungarian cuisine. The vast thermal resources under the soils of the Great Plain feed into medicinal bath. The Puszta at Hortobágy National Park is worth a visit if you want to experience the endless grassy landscape with sweep-pole wells and grazing herds. Lovely villages have unique treasures for the visitors, but the region abounds in historic cities, as well. River Tisza is the focal point of the Southern Great Plain region of Hungary. This area has the highest number of sunny hours a year in the country thus became an agricultural treasure land. The lure of the Southern Great Plain include thermal waters, historic cities, and cultural events. Major Cities & Attractions: Szeged, Gyula, Békéscsaba, Kiskunhalas, Baja, Kalocsa, Kecskemét. The “Hungarian Sea”, 77 km long in the centre of Transdanubia, is known for its opalescent, yellow-green, silky-smooth waters and is one of the country’s most precious natural resources and most visited resort. With a surface area of 600 km2 it is Central Europe’s largest lake. The southern shore’s shallow water is ideal for young children, while the northern shore suddenly deepens and also has long beaches. The silky mud and water are good for nervous complaints, anaemia and exhaustion. Major Cities & Attractions: Keszthely, Balatonfüred, Balatonalmádi, Badacsony, Kál Basin, Tihany, Siófok, Tapolca. The tourism region known as Southern Transdanubia, the southernmost part of the former Roman province of Pannonia, is an area bordered by the Danube and the southern border river, Dráva to the south of Lake Balaton. It comprises a varied landscape of untouched vast forests, wide plains and valleys tucked away behind gentle slopes. The region has a pleasant climate and clean air and is rich in natural attractions and historical monuments. This region is a little Mediterranean island within the country giving home to the top two Hungarian wine regions Villány and Szekszárd. 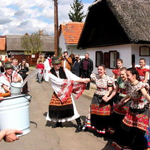 Located in the north western part of the former Roman province of Pannonia, the widely-known tourist region of Western Transdanubia covers the area north of Lake Balaton, and from the western border of the country to the Danube. It is characterized by gentle hills, forests rich in wildlife, springs, bubbling brooks, castles perched atop rocky outcrops, castle ruins, tiny medieval village churches and towns with baroque atmosphere. The regions natural treasures are the thermal springs at Sárvár, Bükfürdõ, Zalakaros, Hévíz, rivers, lakes and wetlands. Major Cities & Attractions: Gyõr, Sopron, Fertõd, Pannonhalma, Ják, Kõszeg, Szombathely, Zalaegerszeg.